E-Scooter App development: Bird electric scooters taking over 100+ cities, you can too! In a two day event at Malibu, Bird’s electric scooters were at a full-on display. The event brought together nobilities from Hollywood, Silicon Valley, and Washington DC. There were many new scooters available for a ride throughout the event. But the major point of attraction was when Bird’s CEO, Travis VanderZanden, and Upfront general partner Mark Suster were seen riding the e-scooters on stage. According to a report in TechCrunch, Bird is said to secure another $300 million at $2.3 billion valuations. The company is said to have brought more than $250 million at a roughly $1 billion valuation. The electric scooter sharing Bird is seen to be slowly taking over the market. According to CEO, VanderZanden, 2018 was about scaling for Bird, however, in 2019 they are really focusing on unit economics of the business. After experimenting with Alibaba models of e-scooters, the company started with creating their own sturdy e-scooters. Bird Zero is the first model that they came up with. VanderZanden revealed that the company operates on $100 million revenue rate even in winter. Bird electric scooter rentals are currently active in 100+ cities and universities worldwide. A few of the places where you can use Bird ride are Los Angeles, San Diego, Washington DC, Arlington, Paris, Tel Aviv, Bay Area, Texas, Brussels, Memphis, Atlanta, Antwerp, Vienna, Zurich, Arizona, Charlotte, Denver, Cambridge / Somerville, Portland, Cincinnati, Detroit and many more. Bird has also opted for an inverse purpose of a scooter sharing program. They have introduced a feature where you don’t have to search for rides the whole day. You can opt for a ride and get your scooter delivered at your location at 8 a.m. and then ride it for all day long. They have also introduced a new feature in their electric scooter mobile app where you can complain about a damaged e-scooter or a badly parked scooter. You may even contact Bird through the app. As Lyft and Uber’s Jump scooters are being introduced newly on to the streets, Bird’s all day scooter-hire option seems like an attempt to keep the riders loyal. They have not yet announced the pricing for the all-day option but riding a regular bird costs $1 to unlock and 15 cents per minute. 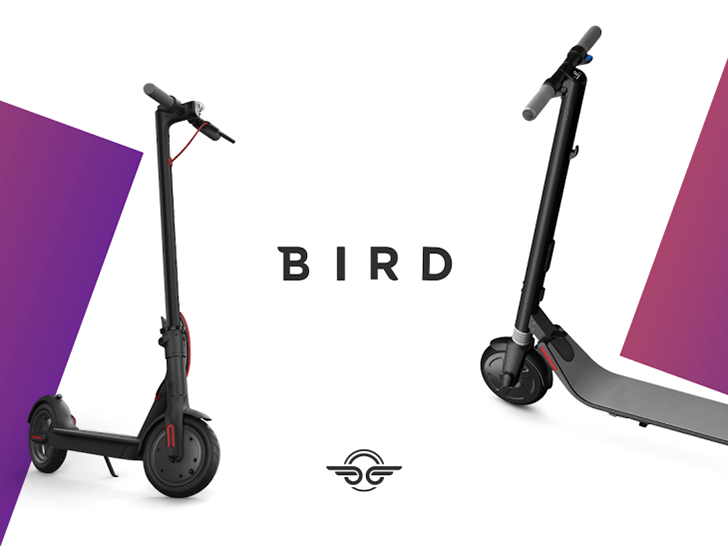 Bird is also expanding its business by letting others run their own fleet of Bird scooters. People can buy the Bird scooters at a low cost and pay Bird 20% commission on all rides. They have initiated a “Bird Platform” that gives an opportunity to the new entrepreneurs to do e-scooter rental business. “They just need to upload a logo, cover the cost of city permit and leave the rest to Bird”, the CEO quoted. Planning to get into the e-scooter business? Being a startup, if you plan to develop an escooter app, you must know the ins and outs of the territory you are about to enter. You need to have a very unique feature in order to make your business stand out in this growing competition between well-known giants in the world of e-scooters. » Download the Bird App: User can download the Bird app from Google play store or iTunes as Bird app is available for iPhone users as well as Android users. » Create your Account: The first screen that you encounter once you install the Bird app is registration. You need to create your own account on the app before you start using it. » Find and scan a Bird: Once you have an account, you can easily find your bird electric scooter and scan the QR code to unlock the ride. » Ride safely to your destination: Bird has provided safety measures and the new bikes have been assembled keeping in mind the safety of the user. » Lock your bird and End Ride: Once you have reached the destination, you need to lock the bike and end the ride. You can pay online through the app itself. Now, that you are familiar with the working of e-scooter app like Bird, you might want to know how the e-scooter business works and what led to its growth. Here’s a link where you can find the success of different electric scooter sharing companies. After reading all of these, there is no doubt the electric scooter rental business is growing leaps and bounds. To top it, there is no doubt it supports the “go green” strategy. And, such method of commute makes transportation easier and more affordable. If you like to explore more about the micro-mobility field and you need help with an app idea on bike-sharing, Coruscate is known as one of the few companies for electric Scooter app development across the globe. And, we’ve already provided a solution for many on-demand electric bikes and e-scooters apps. All you need to do is just fill up a form and connect with us. Together, we can make your business hit the ground running with the best of our technology and talented developers. You might like to know about the success of Bird’s competitors too. Here are links where you can find about the e-scooter giants – Lime, Lyft and Uber(Jump).